Course outline: Create a unique loomwoven neckpiece with bead artist Maria Rypan in a supportive atmosphere. 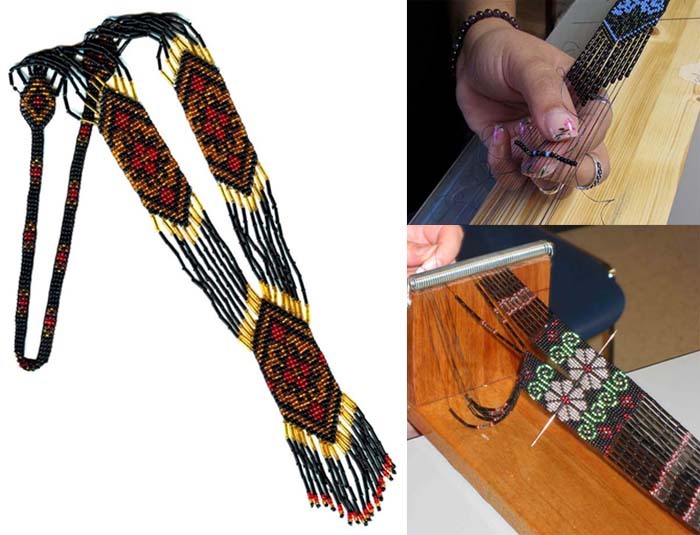 This style uses a long wooden loom to enable easier pre-stringing and weaving of your chosen pattern. Learn to weave between pre-strung connectors; then continue loomweaving the pattern at home. Join your loomwork into a swag or a medallion pendant. Finish it off with a fabulous fringe. If you require a 36″ loom, please indicate it at the time of registration. Series fee of $135 includes choice of one loomwork pattern, twill tape and two 90mm needles for project (Pattern value: $20 to $30). Note: this class will run for three consecutive Tuesdays, 5:30 – 8:30pm each day. long loom or one which is adjustable to 36″ in length. Custom looms are available from Rypan Designs during the first class for $55. These looms have spring coils set on raised wooden ends and three screws on each side for easy management of warp threads throughout the loom weaving process. If you require a 36″ loom, please indicate it at the time of registration. Student must also bring beads and thread to create the project. You’ll be able to purchase these items the first day of your class.